Graham & Graham Property Consultants acts for the client, by providing a bespoke range of personal services to suit clients property and lifestyle needs. Our 'Homesearch Service' saves clients time and money whilst they benefit from having a one-stop solution to make their London property investment opportunity or new home a reality. With no affiliation to property brokers or estate agents we are able to give our clients unbiased advice. 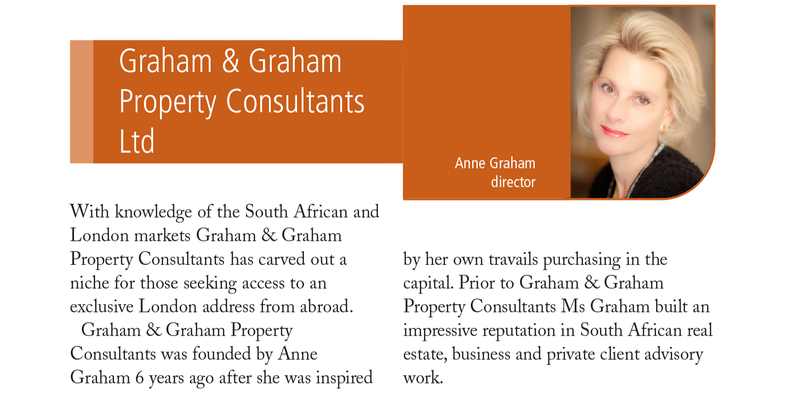 In 2013, Graham & Graham Property Consultants was chosen as one of Private Client Practitioner’s (www.eprivateclient.com) Top 25 Residential Property Buyers. We are London based and concentrate on Central London, specialising particularly in Prime Central London areas such as Chelsea, Kensington and Knightsbridge. We oversee the entire purchase process from negotiation through to completion. G&G acts for the client, by providing a bespoke range of personal services to suit clients property and lifestyle needs. Our service is totally tailored to clients' individual requirements, every single time. Our service is managed in a strictly confidential manner.